BurgerTime World Tour stars renowned burger chef Peter Pepper as he travels the globe challenging chefs from the world capitals of cuisine. True to his retro roots, Peter Pepper will be tasked with building enormous burgers while running away from wacky food-gone-wild enemies such as Frank Furter the Sausage, Sonny the Egg, and new enemies such as Habba De Niro, the Habanero Pepper. Peter Pepper will need to overcome new obstacles such as giant chasms, wall spikes and hungry bosses to strategically find the fastest way to put together each burger. And with 50 sizzling levels, BurgerTime has never been meatier. 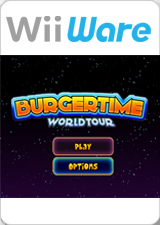 The graph below charts the compatibility with BurgerTime World Tour since Dolphin's 2.0 release, listing revisions only where a compatibility change occurred. This page was last edited on 16 September 2017, at 08:55.